The Liars Club: First Annual Tie-One-On Tie-Athlon a Success! First Annual Tie-One-On Tie-Athlon a Success! Tie 1 On for Smithgall Woods--what a great day--a winning day for everyone involved. 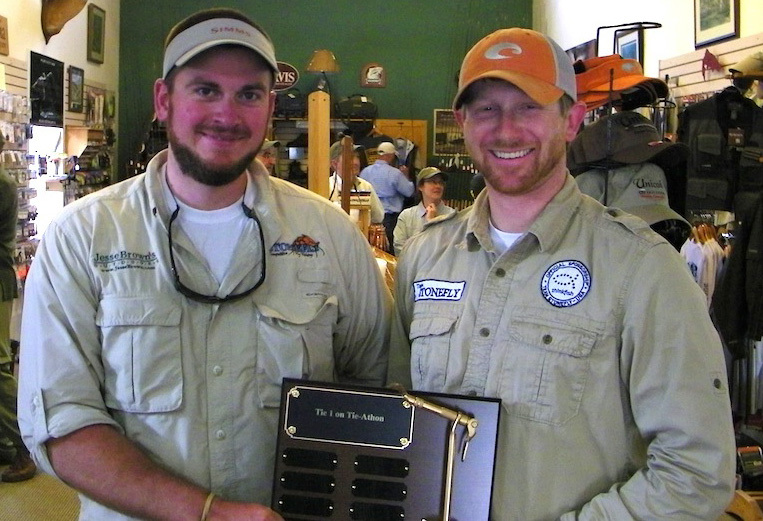 On Saturday, March 24, 12 tyers (6 teams of 2 per team) of aspiring fly tyers gathered at Unicoi Outfitters in Helen, Ga. to have some fun and to help out a worthy cause located in our community - Smithgall Woods State Park. Five hours and 450 flies later, we had raised over $2,500 in pledges - this amount is still hard for me to believe. Smithgall Woods was definitely a winner because they will be the recipient of these donations by way of the Friends of Smithgall Woods - hopefully this will help out with the conservation and kids' programs that they offer. 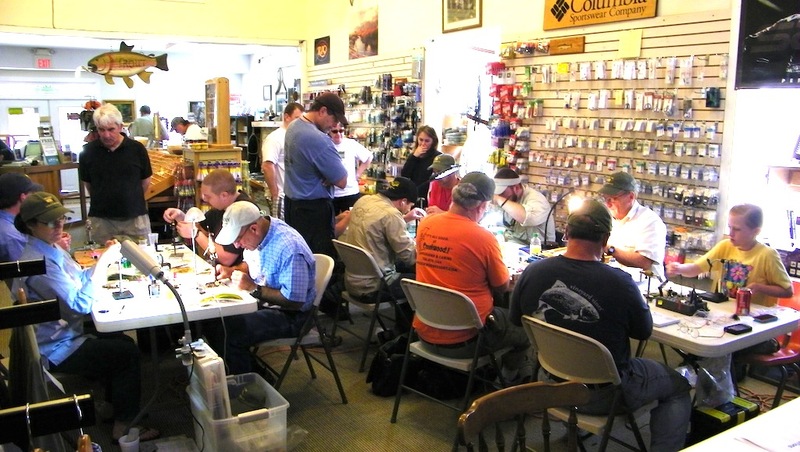 Unicoi Outfitters, Foothills chapter of Trout Unlimited, and our own "Tie 1 On" group were all winners because they were responsible for sponsoring this inaugural fly tying event - which we hope will become an annual fund raiser for worthy causes in our community. But I think the real winners would have to be all those who took part in the event - the fly tyers who worked hard to raise the pledges and tied the flies, the volunteers who helped set up and clean up the mess we made, the cooks - who boiled the peanuts and grilled the dawgs, those who judged the event, and especially those who donated - you made this event successful. Thanks to all of you - a man is truly blessed by the friends in his life.